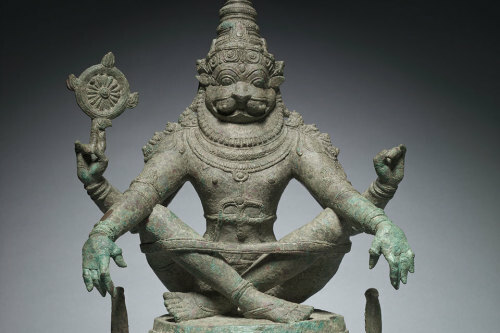 Narasimha (“man-lion”) is the fourth incarnation (Avatar) of Lord Vishnu. He is worshipped in deity form by a significant number of Vaishnava groups throughout India (especially in the South) and is primarily known as the ‘Great Protector’, being a form of Vishnu who specifically defends and protects his devotees in times of need. 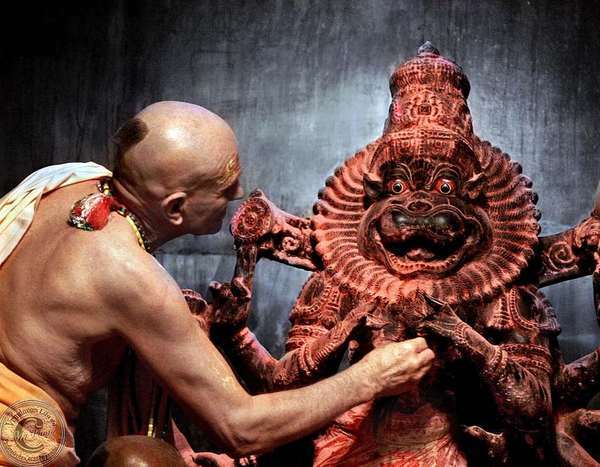 There are 13 other Sannidhis for Sri Narasimha Bhagavan in Tamil Nadu besides , Singaperumal Koil. Number of them are part of 108 Divya desams or are in one of the Divya Desams as a separate sannidhi. Singaperumal Koil is at a distance of 30 miles from Madras City on the Main rail route to Kumbakonam.The icon of Narasimha is hewn out of a huge Rock. Pilgrims, who want to do pradakshinam go around the rock out of which is hewn. The Moortham at Thiruneer -Malai is Saantha Narasimhan. The Moortham at Triplicane (Telliyasingam celebrated by Thirumangai) has a Mudra or hand gesture , that symbolizes the Lord”s invitation asking the child Prahlada to come near. Narasimha Sannidhi at Thirunagari is in the Western Praakaaram . This stalam is 6 miles from Seerkazhi. A rare form of Narasimha , Ashta Bhuja Narasimha doing Punishmnet iof the evil (Dushta Nigraham) and protecting the virtuous (Sishta Paripaalanam) with each set of four hands is worshipped here. This Moortham is a marvel of the Silpi. Legend has it that Brahma got permission from Guhai Narasimhan at Kanchi to start his Vedic Sacrifice, that culminated in the appearance of Hastigiri Varadarajan in the Flames of the Yaga. Chasing Hiranya and holding him on His lap. there. Melattur , the home of Bhagavatha Melam on Narasimha is nearby. The shrine at Niravaloor, where the Sixth Jeeyar of Ahobilas Mutt performeed a Miracle and saved the village from the curse of irate Auvyyar., that condemned the village to eternal drought. Namakkal Narasimhan has the reputation as a Vara Prasaadi ( Immediate Boon giver) abd His consort, Namagiri Thayaar is famous for her infinite mercy to the devotees. There are many famous Narasimha temples in Andhra Pradesh in addition to the most celebrated Ahobilam. These are at Ananthavaadi, Mangalagiri, Simhaachalam and Yadagirigutta. Thiruvaheendrapuram is the Divya Desam, where Swami Desikan spent many years and worshipped Devanatha Perumal and Hembjavalli Thaayaar. It is close to Cuddalore on the same main line.